The flood of 1953 was the greatest natural disaster to occur in the Netherlands in the 20th century. The combination of a heavy north-westerly storm and a spring tide caused flooding in large parts of the country. The disaster claimed the lives of 1,836 people and tens of thousands of animals, and many homes were destroyed. On 29 January 1953 a heavy north-westerly storm developed to the south of Iceland and moved southwards via Scotland. In the northern section of the North Sea, the wind turned in a north-north-westerly direction, creating a 1,000-kilometre storm field that headed straight for our coast. The storm with wind speeds of force 10, struck the Dutch coast on the evening of Saturday 31 January. In Zeeland the storm peaked at 10 PM that night, in IJmuiden at 1 AM and in Den Helder at 4 AM. The combination of severe north-westerly gales and the spring tide caused a spring flood. The sea level surged to exceptional heights. At Hook of Holland, the water reached a height of 3.85 metres above Normal Amsterdam Level (NAP) (an NAP level of 0 m is now roughly the same as the North Sea's average sea level), a dangerously high level for the densely populated hinterland of the province of Zuid-Holland. 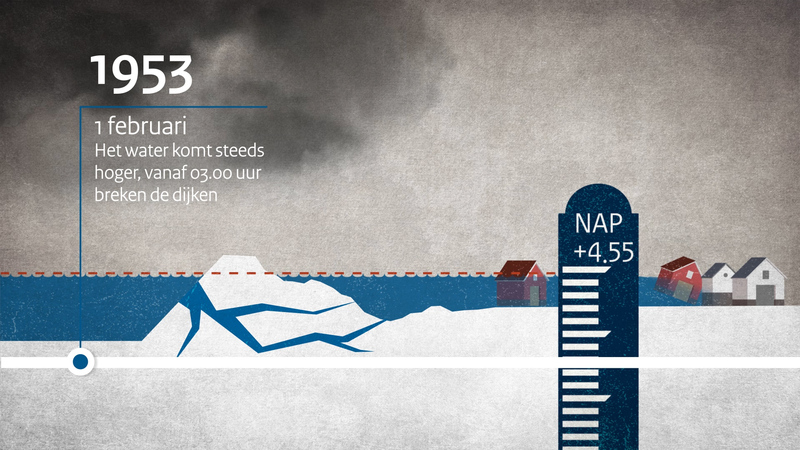 The highest water level in the province of Zeeland was measured at 4.55 m above NAP at 3.24 m in the morning. Many of the dykes were unable to withstand this level and were breached. The dykes were unable to cope with the volume of water and succumbed in more than 150 places in Zeeland, Zuid-Holland and Noord-Brabant, with disastrous consequences. On Sunday afternoon, residents were shaken by a second storm surge that caused even more casualties than the first. The flood took the lives of 1,836 people. More than 72,000 people were evacuated, 47,000 cattle and 140,000 poultry drowned. More than 150,000 hectares of land was inundated causing severe damage to infrastructure and farmland. The natural disaster destroyed 4,300 houses and other buildings and damaged 43,000 more. The total cost of the damage was 1.5 billion guilders (the equivalent of 5.4 billion euro in today's money). One of the reasons the severe storm could cause a disaster on such a scale was the poor condition of the dykes. Many of the dykes in the south-west of the Netherlands were too low and too weak. In the preceding years the water boards had carried out little maintenance on the dykes and there had been too little investment in them. Although the national government had spent some money on flood protection, the issue had received less priority during the post-war reconstruction after 1945. Part of the reason why the disaster has gone down in history as a rare event, is the extreme water levels and the duration of the storm, which lasted more than twenty-four hours. After the disaster, the damage had to be repaired. The national government paid for the repair of the breached dykes and coordinated the operation. The Dyke Restoration Coordination Agency was established under the auspices of Rijkswaterstaat. Thousands of workers and more than 4,000 troops, including some from other countries, joined forces to repair the dykes. On 6 November 1953, nine months after the disaster, the final hole in the dyke system was sealed in Ouwerkerk on the island of Schouwen-Duiveland in Zeeland. Aid operations were organised in the Netherlands and other countries to help the affected areas. The Red Cross played an important role in these efforts. Donations of money, goods and clothing poured in from around the world. Every week a fundraising programme was broadcast on the Dutch radio under the motto ‘Purses open, dykes closed’. Dutch footballers played a friendly international match against France to raise money for the flood victims. Much of the Netherlands lies below sea level. The disaster of 1953 demonstrated more clearly than ever the importance of protecting the country properly against flooding. Stricter safety standards were adopted for primary flood barriers. The barriers were raised to the minimum height (the so-called Delta height as prescribed in the Delta Act) required to protect the Netherlands against flood tides and money is still invested every year to further strengthen the flood defences. Flood protection is a never-ending task in this country. One of Rijkswaterstaat’s responsibilities is therefore to raise public awareness of the risks of flooding in the Netherlands. One of the ways we raise awareness and keep people informed is with news reports on our website and our social media channels. In 2018, for example, we posted frequent reports on the New Years storm on January 2 and 3 (with a live blog) and the peak water level in the Rhine near Lobith. The Watersnood museum in Ouwerkerk is devoted to the events during and after the flood of 1953. In addition to describing the facts and circumstances of the flood, the museum also raises visitors' awareness of what they can do to improve their safety. For example, one section of the museum is devoted to explaining to children and adults what they will need to take with them if flooding forces them to flee to the attic of their home. Overstroom ik?, roughly translated to 'Do I submerse? ', is a website on which people can check whether they are living in a high-risk area. By entering their postal code, visitors to the site can see how high the water will rise in the event of a flood where they live. The site also provides tips and recommendations. For example, what is the best response to a threat of flooding: to evacuate or to stay where you are?